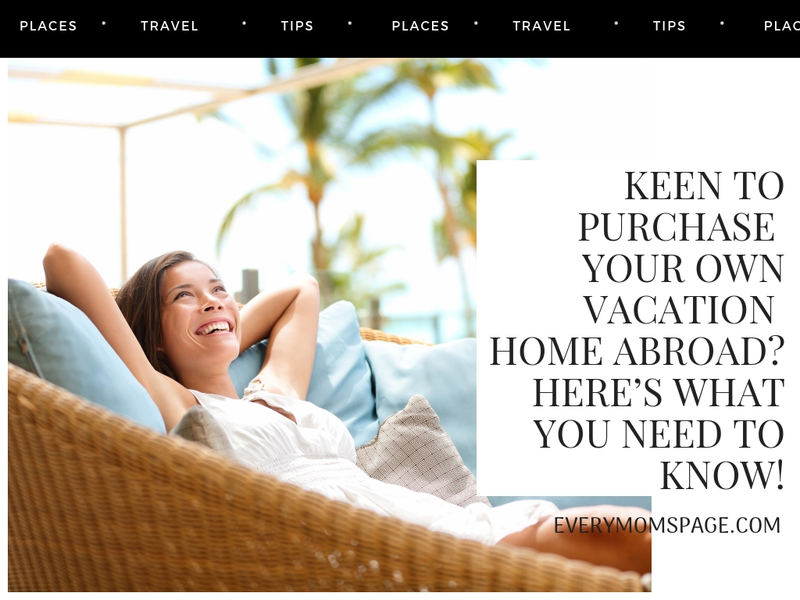 EveryMom'sPage: Keen To Purchase Your Own Vacation Home Abroad? Here’s What You Need To Know! Keen To Purchase Your Own Vacation Home Abroad? Here’s What You Need To Know! Perhaps you have been thinking about it for a while, and love the idea of having your own vacation home abroad. However, you might also be feeling a little anxious and unsure about the idea - after all, choosing to purchase a holiday home abroad is a big deal and there’s a lot that you need to consider. The good news is that when it comes to buying a vacation home abroad there are various benefits that come with doing so, and it’s a decision that you are unlikely to regret. That is, as long as you get the ins and outs of the process right. The fact is that while you might want to purchase a vacation home abroad, you might also feel as if it’s somewhat of a risk. After all, there is a lot that comes with making this kind of financial investment, which is something that tends to hold a lot of buyers back. However, there’s no need to stress as there’s plenty of advice available to make the process as stress-free as possible. For everything that you need to know about buying a family vacation home abroad, have a read of this. First things first, it’s essential that you spend some time focusing on your budget. The chances are that you already have an idea of the budget in your head, so it’s crucial that you work this out properly. Consider how much you can afford to spend as a deposit and what you can afford to pay each month for the mortgage. It’s vital that you get this sorted beforehand, as there’s a lot that you need to consider. You should also take the time to think about things like how you will make owning the property affordable. If you are worried about this, then you might want to consider letting it out for holiday lets while you aren’t using it, as that way you would have the potential to make a fantastic income from the property. This could make purchasing the vacation home of your dreams far more affordable. Step one of buying a house abroad is thinking about what it is that you and your family need from a second home. What you need to consider is what you need in the short-term as well as what your family will need in the long-term as your family grows and changes. What you need to consider is the fact that you won’t be heading off to your vacation home for a one-off break, this will be your family’s go-to travel destination for many years to come, so you need to get it spot on. This property would need to perfectly meet your family’s needs. You need to consider where the property is situated in relation to where the main attractions of the location are located. How close to different amenities do you want to be? Where are the shops, the beach, the city centre, and so on? Where are attractions such as cinemas, water parks, theme parks, and various other interesting things to see and do? You also need to think about the space that this property will give you - is there enough room for your family as it grows and develops? It might be fine now but what about as your kids get older - will there still be adequate room? Are there enough bedrooms and bathrooms? Does the property offer outdoor space? Does it have facilities like a pool? You need to think carefully about what any property offers you and your family. Where ever you plan on buying from, whether it’s online from https://rumahdijual.com/kalkulatorkpr.php or from a local estate agent, it’s essential that you take the time to do plenty of research into the area before you make your offer. If you are going to ensure that the property that you pick is ideal for your family, you need to do as much research as possible into the area and what is on offer there. The truth is that the best decisions are always informed ones, so when it comes to making the decision to purchase a holiday home abroad, it’s essential that you take the time to do adequate research. The last thing you want is to rush into a decision that you later live to regret. A great way to learn more about the local area and what it actually offers is to talk to the local people. You will find that local people have the best insight about an area because they live there, so if you want to get the low down on a destination it’s best to take the time to talk to them. You could also talk to other holiday homeowners from the area to see what they think about the location as a destination for your vacation home. They should be able to provide you with a fantastic insight into the area and what it offers. If you are considering buying a vacation home, you may have some questions that you feel that you need answers to. The fact is that if you can’t find these answers yourself, then you might want to consider seeking some expert advice. It’s important that when it comes to purchasing a property abroad, that you know what you are letting yourself in for, and experts in this area are the perfect people to talk to you about this. It’s crucial that you understand what you are doing in terms of the legal side of things, and that you have an expert on hand to help you grade any potential properties to ensure that they don’t have any serious structural problems. You need to consider seeking assistance from a legal expert in property purchasing abroad, in addition to an expert in checking the property for any problems before making a purchase. As the last thing that you want is to buy a property only to find a few months later that it has serious stability issues or that it has internal problems that are going to cost thousands to fix. That’s why it’s best to be clued up regarding property checking and not be afraid to work with the experts to ensure that a property is actually in as good condition as it’s said to be. If you are keen to purchase your own property abroad for you and your family to use as a vacation home, then you most probably have a lot to think about. The fact is that when it comes to buying property abroad, it’s not easy to understand the ins and outs of the process. There is a lot that you need to consider, which is why it’s so important that you take the time to get things right and don’t rush into anything. It might be beneficial to have a read of resources like https://www.emigrate2.co.uk/how-to-buy-a-property-abroad-in-6-steps/, for instance. The more you read, the more informed you will be. The chances are that you will love owning a home abroad, as it will make family vacations simpler, easier and far more affordable, but what you have to remember is that there’s a lot that you need to carefully think about before choosing to go down this route, as the last thing that you want is to regret your decision to make the purchase.